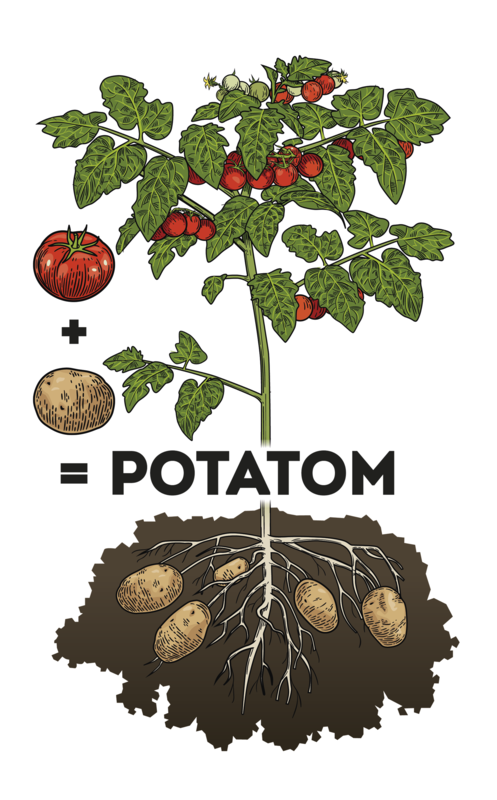 Potatom: tomato and potato in one! Pick-&-Joy® Potatom is a rather unique tomato and potato plant full of surprises – a must-have for the vegetable garden or terrace. This very special produces both tomatoes and potatoes! Potatom requires more attention than other Pick-&-Joy® fruiting vegetables. Potatom comes as a juvenile plant, so no fruit will have yielded when you receive it. You need to take good care of Potatom before you can enjoy its delicious tomatoes and potatoes! A pleasant and delicious challenge! How does the Potatom work? Potatom produces around 80 to 100 cherry tomatoes. These cherry tomatoes are healthy, delicious, and crunchy. At the end of the season when all tomatoes have been plucked, cut off the stem and leave the crop for a few weeks. The potatoes will then ripen in the ground. You can dig them up after ten to fourteen days. Turn over the ground gently to receive the ultimate reward. You should be able to unearth 2 to 3 kg of potatoes! The potatoes are from the well-known Allias variety – a firm, small to medium yellow potato. They are firm-boiling and taste delicious. Enjoy! Step 1: Plant the half-grown plant in the open ground or in a large pot (Ø 40 cm). Step 2: Use a stick for extra support and tie it to the plant. 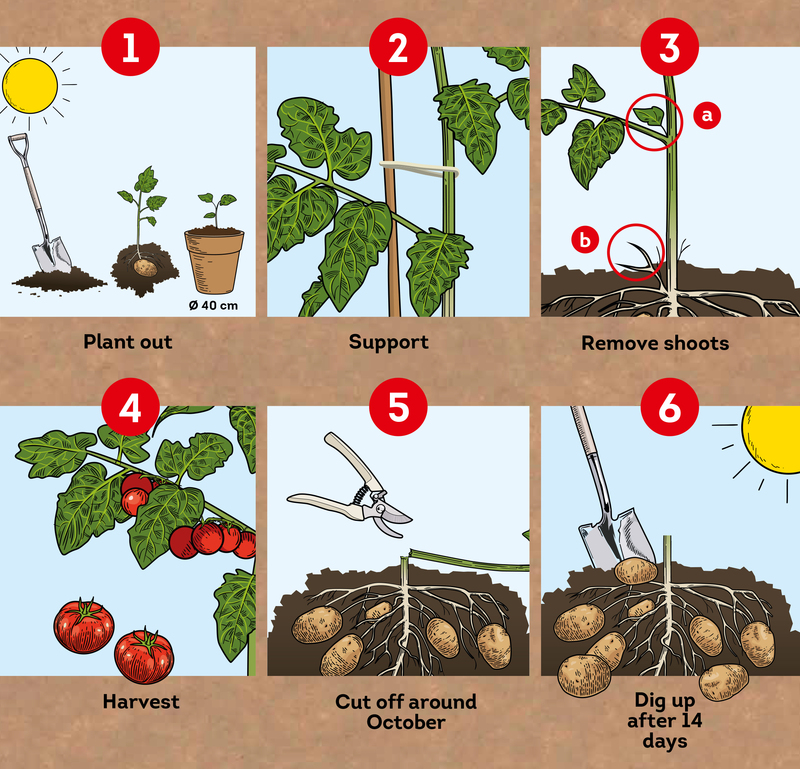 Step 3: Remove the side shoots (a) from the plant and the potato shoots (b) above the ground. Step 4: Harvest the tomatoes the entire summer (from 8-10 weeks after purchase). Step 5: After harvesting all tomatoes, cut the stalk, and let the crop rest for 10-14 days. Want to know more about Potatom? © 2017 - 2019 Vreugdenhil Young Plants .